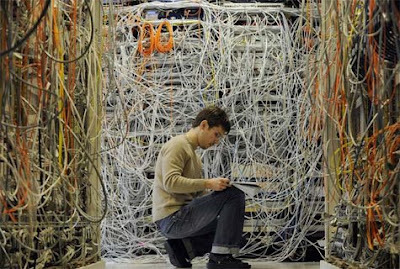 An engineer checks communications cables in the Media Gateway Lab at the Ericcson research and development center in Budapest, Hungary. Got my laugh for the day. that would drive me craaaazzzzzzzzzzy! I think I might actually enjoy the chase. I think that's 'the word' I was looking for...now I'll go play fetch...and look it up. Seems there'a a whole lotta' hangup and stealing going on. Paying for 'wire'...when 'software' is worth so much more. You have a great 'eye' and may I add, 'ear,' for beautiful things.